Interim EXCO (from left): Alvin Lim Zhi Xiang (BBM 2016), Annabelle Chew Xin Ying (BBM Year 4 student), Lok Xin Min (BBM 2017), Samuel Heah Tian Song (BBM 2016), and Samuel Lee Jun Jie (President, BBM 2016). 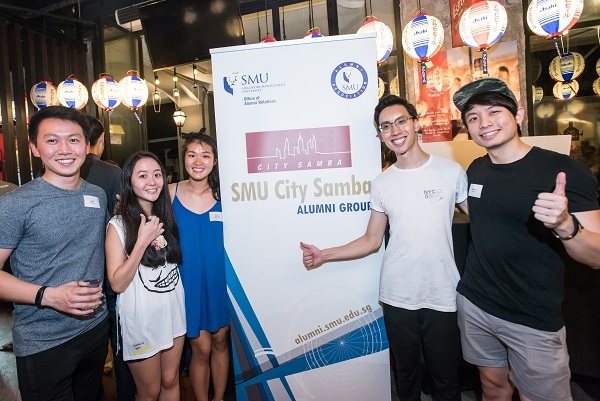 Officially launched on 26th August 2017, the SMU City Samba Alumni Group consists of alumni with a strong passion in Brazillian Samba Batucada music with a fuse of funk, Afrobeat and local ethnic rhythms. Arising from the student club Samba Masala, the group of performers aims to spread their love for the Brazilian percussion culture and excellent showmanship locally and internationally (in the years to come), and experiment new dimensions of percussion instruments, choreography and essentially, to make art more relatable to today's audiences. To give back to Samba Masala through interaction with the current undergraduate members. If you have an interest in Brazilian percussion or simply hope to explore the art scene further, please email to citysamba@smuaa.org.sg.